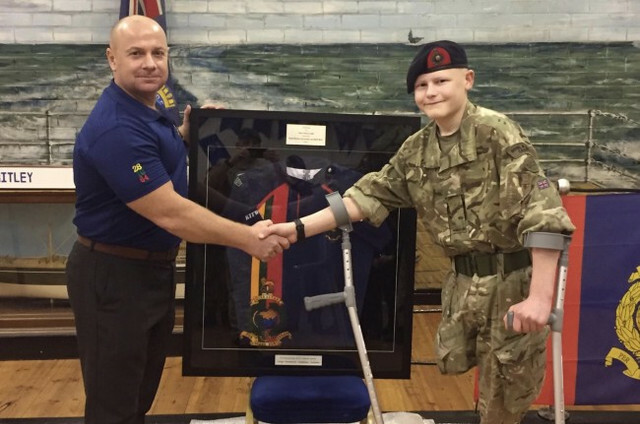 Rugged Rugby players, pedal –pushing policemen, a Christmas Carolling choir and swimmers in the icy briny are among the multitude of well-wishers raising funds for a brave young Royal Marines Cadet in his fight against cancer. Thirteen-year-old Oliver Liddle, son of former Royal Marine Steve Liddle, lost his mother, Kerrie, to breast cancer six years ago. Now Oliver has had his right leg amputated above the knee after being diagnosed with osteosarcoma. “The hardest things I’ve ever had to do are tell my boys their mother was never coming home and tell Olly he’s got cancer”, said Steve, 43, who served five years in the Corps as a signals specialist with 40 Commando before returning to Civvy Street in 2003. Steve said that Olly was incredibly motivated and quite determined to work his way back to full mobility. “He has some wonderful role models including Jack Peters, a 25-year old one-legged Paralympics skier from Sunderland, and also a one-legged Argentinian rugby player who visited Rockcliff Rugby Club. Olly has been an enthusiastic member of the Whitley Bay unit for more than three years, particularly enjoying the field craft and more physical aspects of training as he had ambitions to follow in this father’s footsteps and join the Corps. His other great love is Rugby, and both he and his dad have played for the town’s Rockcliff RFC. A keen athlete and ferocious-tackling Rugby player, Olly thought he had growing pains when his right leg started to become painful last year. Sadly, it signalled the onslaught of the bone cancer which culminated in amputation in September 2018. Fellow members of the Rugby club were so impressed by the boy’s courageous battle that they raised nearly £12,000 for the Teenage Cancer Trust. His dad raised a further £4,515,for Cancer Research by signing up for Ultra White Collar Boxing and competing in a bruising hammer-and-tongs sponsored boxing bout in Newcastle after just eight weeks’ training. The Rugby Club then decided to continue raising cash specifically aimed at helping Olly in his battle to regain full mobility and achieve his goals of taking part in triathlons and ultimately the Paralympics. “When we heard the sad news about Olly we were inspired to help this young lad who has played for our club for seven years,” said Martin Train, the club’s head coach for Olly’s Under-14 age group. “The way the club, the wider rugby family and the whole community got behind us has been out overwhelming." He and the other coaches launched Rock4Olly after some of Olly’s teammates visited their chum following his chemotherapy and decided on a sponsored mass head shave “to keep him company”. The event proved so popular it raised just under £2,000. Then Northumbria Police decided to get on their bikes at a local shopping centre and organised a static cycle ride the distance between Rockcliff Rugby Club and Twickenham Stadium, around 600 mile, in 24 hours. The boys in blue went far beyond their target. “We managed to keep pushing on and pedal almost 1,000 miles,” said Neighbourhood Sergeant Guy Morgan. They also clocked up a useful £2,000 plus for Rock4Olly. Just before Christmas the Whitley Bay-based choir Bayvox chimed in and decided Olly would be the chosen charity for their annual carol concert. Their tuneful tones brought in another £700 and on New Year’s Day 30 hardy members of Rockclliff RFC’s girls team showed they were just as tough as the boys – if not tougher – by taking part in a sponsored plunge into Whitley Bay’s icy North Sea waves, in front of more than 1,000 astonished onlookers. 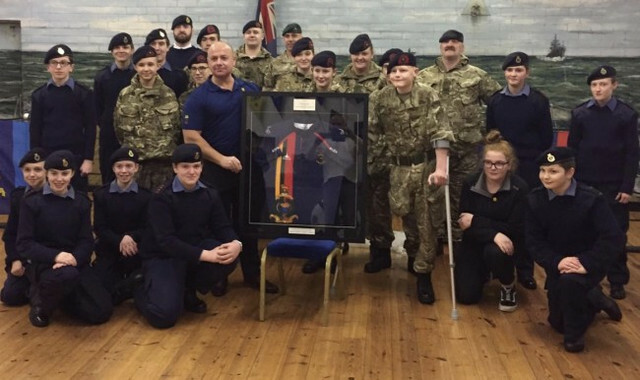 In recognition of Olly's fight, RMA RFC has donated a Corps Rugby Shirt which was framed by Central Office and subsequently presented to him. Additionally, RMA RFC has asked Olly to be the mascot for the Corps Families Day Game at CTC in September and will also host Steve and his brother. Perhaps the last word should go to Olly’s Royal Marines Cadet Detachment Commander, Sgt Brain Fox.